Total boat care made easy! The 303 Boat Kit is a maintenance kit for all marine surfaces including fiberglass, plastics, carpet, metal, vinyl, and rubber. The 303 Boat Kit includes manufacturer recommended products plus 303 Aerospace Protectant, the only protectant with an SPF of 40. Give your boat the very best preventative care with the 303 Boat Kit! 303 Aerospace Protectant 2 fl. oz. 303 Aerospace Protectant is the most versatile and powerful protectant on the market. It has an SPF of 40 – the most available in any surface protectant, Use 303 Aerospace Protectant on virtually any solid surface, including plastics, rubber, acrylic, fiberglass, vinyl, and finished leather. 303 Aerospace Protectant is never oily or greasy. It has a matte finish. 303 Aerospace Protectant repels water and dirt, and it resists stains. Use 303 Aerospace Protectant on vinyl seats, fiberglass surfaces, plastic instrument panels and gear, inflatable boats – virtually anywhere! 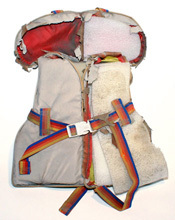 The left side of this life vest was treated once with 303 Aerospace Protectant. After 35,000 hours in the sun and rain, it held up better than the untreated right side. 303 Fabric Cleaner 2 fl. oz. Use 303 Fabric Cleaner on your bimini top to remove mold, mildew, and dirt. The biodegradable formula removes oil, grease, dirt, coffee, tea, juice, wine, and pet stains from any water-safe indoor and outdoor fabric. That’s right – anything that is unaffected by water can be safely cleaned with 303 Fabric Cleaner! Use it on the bimini top, boat cover, awnings, life jackets, and carpet. 303 Fabric Cleaner is recommended by Sunbrella. Clean and protect bimini tops with 303 Fabric Cleaner and High Tech Fabric Guard. 303 High Tech Fabric Guard 2 fl. oz. Shield all indoor and outdoor fabric from the sun and stains with 303 High Tech Fabric Guard. 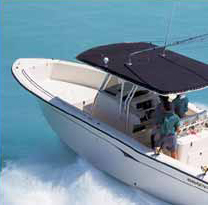 Use it on fabrics, like the bimini top, where 303 Aerospace Protectant cannot be used. 303 High Tech Fabric Guard repels water, dirt, grease, and slows sun damage. 303 High Tech Fabric Guard is silicone-free. It defends all fabrics against mold, mildew, and soil. Apply 303 High Tech Fabric Guard on new fabrics or after cleaning to maintain the cleanliness of the fabric. Use only on dry fabric. 303 High Tech Fabric Guard is recommended by Sunbrella and Dickson, makers of outdoor fabrics. 303 Shower Shield 2 fl. oz. Keep your boat shower sparkling with 303 Shower Shield! 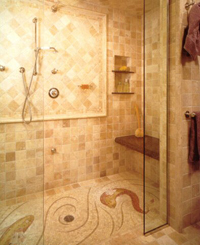 Spray 303 Shower Shield on fiberglass, marble, laminate, ceramic tile, stainless steel, metal, glass – practically every surface in a bathroom! The long-lasting coating prevents water spots, mineral deposits, soap scum, and films for 6 weeks on average. 303 Shower Shield is non-toxic, non-flammable and biodegradable. It leaves no residue. 303 Shower Shield will repel water spots all over a fiberglass boat. 303 Shower Shield protects fiberglass surfaces all over your boat, including the shower. Learn what it takes to clean and maintain marine fabrics. You can start with the 303 Boat Kit, packed with Sunbrella-recommended products. This DVD will give you more great tips. The 303 Boat Kit also includes two info-filled brochures: “What You Need to Know About Vinyl” and “What You Need to Know About Outdoor Fabrics”. The 303 Boat Kit is compact and easy to stow on any size vessel. Keep a clean supply of Cobra Microfiber Towels on board to apply 303 products to any surface. The 303 Boat Kit is an excellent sample pack of 303 products. You’ll find many uses beyond the boat:: for example, car care, furniture cleaning and protection, patio furniture care, awnings, carpet, grill and hot tub covers, bathrooms, clothing and shoes, and so much more. Come back to Autogeek to get larger sizes of 303 products for all your home, car, and boat care needs.